In the last six years there have been over a dozen photo competition articles (the most recent April 2018) written on some aspects related to Spider Orchids. So, with another Spider Orchid winning the competition it is about time to answer the question – What Is A Spider Orchid? Around the world, the common name Spider Orchid has been bestowed upon a number of orchids in different genera. In Australia, they have principally been applied to a large group within the genus Caladenia, a highly diverse cumbersome genus. Caladenia in the broad sense is distinguished by erect flower stem and single linear, ovate to lanceolate leaf, (both hairy), labellum distinctly different from the other segments, generally fringed, curved and decorative calli. But within this genus it has been recognised for a long time that there are several distinct but varied groups, which has been reflected in the common names – Dragon, Pink Fingers, Hare, Spider, Wispy Spider, etc. Consequently in 2001, several segregate genera were published including Arachnorchis for the common named Spider Orchids. This was not widely accepted, as reflected by the Herbaria of Australia. Indeed the original authors are no longer using the segregate names. Yet despite all that, the segregate names have proved to be very practical for fieldwork. By using the segregate name when species is unknown, extra information is communicated. This was the case with Pauline’s picture. Yes she photographed a Caladenia but which one? It was an Arachnorchis species. With that in mind, it is time to consider the features that make up a Spider Orchid or Arachnorchis. In following through a dichotomous key Arachnorchis is immediately separated out from the rest of the Caladenia by the presence of two yellow waxy glands at the base of the column. As this is not the immediate feature seen, the following chart comparing it with the very similar looking Joneseopsis should assist with recognising some of the main distinguishing features. For the final meeting of the year we chose the best of the 2016 monthly winners of the picture competition. Here in Australia we are fortunate to have such a variety of orchids. They may not be as big and showy as some of the overseas orchids but the diversity of shapes fires the imagination as reflected in this year’s monthly winners, when put together. The common names of the winners – spider, leopard, flying duck, cowslip, zebra, helmet, bluebeard and greenhood – reinforce this theme of diversity. Patterns and colours contribute to the variety of our orchids. Australian orchid colours run the gamut of the rainbow and more, with Australia being home to most of the naturally occurring blue orchids in the world. This colour fascinates and allures people around the world so much so that nurseries will dye a white orchid blue because it will sell. There is even a website devoted to the colour called, not surprisingly, Blue Orchid and the popular band master Glenn Miller wrote a song titled Blue Orchids (1944). Could this be why the very clear winner for the year was Claire Chesson’s Pheladenia deformis common name Bluebeard or Blue Fairy? Claire Chesson on your most beautiful picture. Claire won the August competition. As a reminder, below are the other winners for the year. Click on the image to see the related articles. Quite a few pictures were entered this month. and Helen Lawrence’s Arachnorchis argocalla. Helen’s picture of the nationally endangered A. argocalla was the outstanding winner. Now known as the White Beauty Spider Orchid^, it was featured last year as a winner with Pauline Meyer’s June 2015 entry*. This is one of our largest spider orchids. For size, beauty and delicacy it rivals the Western Australian Caladenia longicauda ssp. eminens (White Stark Spider Orchid) and A. venusta, syn. Caladenia venusta (Graceful Spider Orchid) from Victoria and the South East. It shares many similarities with these two species in that they are reasonably good size white flowers with a stiffly hinged labellum that has long, thin teeth and the segments have threadlike tips without clubs. It is separated both geographically and in the type of habitat from these two species. A. argocalla is a plant of the inland hills and valleys. Though primarily a white flower and part of the A. patersonii complex, A. argocalla has red colouring in the labellum which according to Backhouse may possibly indicate genetic introgression (that is long term mixing of the gene pool) with either the A. reticulata or A. leptochila complexes. Certainly, the colour of the labellum was quite variable ranging from white through to a deep red. ^Previously known as Common White Spider Orchid because of its abundance but now only known to a limited number of locations. NB: November Competition will be judging the monthly winners from this year. The following video is by Orchid Hunter, Julian Pitcher. Julian is concerned about the conservation of orchids and is also keen to teach others about Australia’s unique orchids. At the time of the visit, Julian was resident in Victoria; now he resides in Queensland. Enjoy an interstate visitor’s view of our beautiful orchids. This is the last of the three terrestrial fact sheets in Culture Notes that NOSSA has produced on growing terrestrial orchids. All three facts sheets can be downloaded – Click on the following for Fungi Dependent, Slow Multipliers and Fast Multipliers. Some 3/4 of Southern Australian terrestrial orchids are fungus dependent throughout their life cycle. Orchids that are fungus dependent have very specific cultural requirements. The fungus must be grown in the pot with the orchid. Sometimes a third entity such as a shrub or tree is involved in the fungal relationship. A minimum disturbance culture is used. Limited numbers are available each year. Other fungus dependent species are rarely available. Those in cultivation have mostly come from rescue digs in the past. NOSSA has started a seed kit project to help overcome this vacuum. 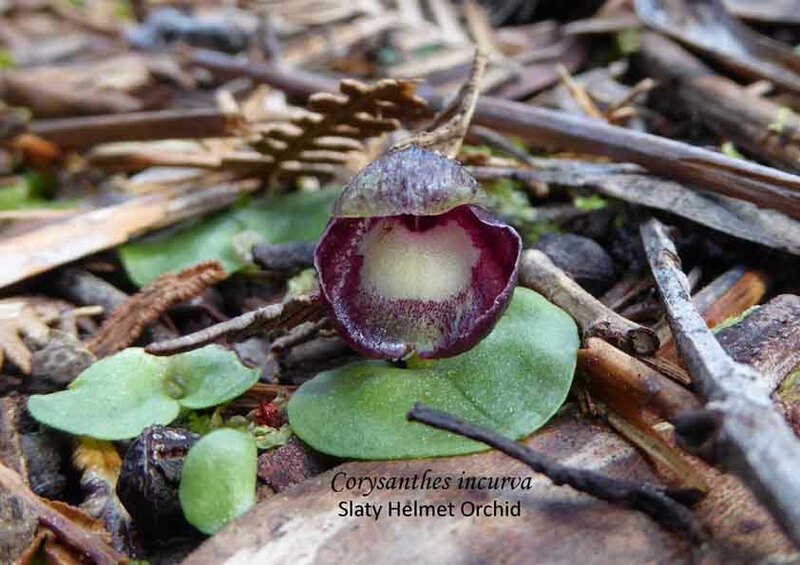 GROWTH HABIT: Australian ground orchids follow an annual growth cycle comprising 6 – 8 months as growing plants under cool (5 – 20°C max, 0 – 14°C min) moist conditions and 4 – 6 months as dormant tubers in hot dry (18 – 42°C max, 12 – 30°C min) conditions. The new tuber is produced in winter – spring. Each tuber sends up a shoot to the surface in Autumn and leaves grow rapidly in late Autumn/early Winter as temperatures fall and the rains set in. Sometime in October/November the leaves go yellow and then brown and dry as the days get longer, hotter and drier in late Spring. LIGHT/SHADE: In Adelaide they thrive in a shadehouse of 50% shadecloth. Some species prefer heavy shade, others full sunlight, but most will adapt to a wide range of light intensity. If the leaves and stems are weak and limp or if the leaf rosettes are drawn up to the light then the shading is too dense and the amount of light should be increased. FDs are mostly spring flowering and like higher light intensities at flowering time. flowers may have pale colours if placed in heavy shade, even temporarily, when buds are just starting to open. In very cold areas an unheated glasshouse may be required for frost protection although light frosts do not worry the majority of species. AIR MOVEMENT/HUMIDITY: All species like good air movement and will not thrive in a stuffy humid atmosphere especially if temperatures are high. POLLINATION/SEED COLLECTION: FDs seldom multiply so must be propagated from seed. Flowers on the strongest plants of the same species growing in pots are cross pollenated by hand to set seed pods. The flowers collapse in a day of so and pods ripen in 4-8 weeks. Pods are collected as they change colour from green to brown, which happens quickly on a hot day in October/November. Tea bags can be tied over the pods to catch the dust like seed if frequent visits to site are not possible. Pods are stored dry in paper envelopes indoors over summer. Seed can be sprinkled on mother pots or scattered on bush sites. SEEDLING CARE: Seedlings can be raised by sowing seed around potted mother plants. At Easter time, just before the rainy season begins, the dust-like seed is mixed with fine sand in a pepper shaker (minimizes seed loss) and sprinkled on top of the pots and watered in. Germination occurs in Autumn/Winter as that is when the fungi are most active. Tiny leaves appear from July to October. The seedlings form miniscule tubers on droppers about 1 – 2cm below the surface. Seedlings take up to five years to reach flowering and are best left undisturbed until larger. WATERING: The soil should be kept moist at all times during active growth by watering gently if there is no rain. Hand watering is especially necessary in spring as soil in pots dries out more rapidly than in the garden. Watering must be done slowly so that the mat of needles on the surface of the pot is not disturbed. Slugs and snails love these plants and must be kept under control. Raising the pots off the ground on galvanised steel benching is very effective in controlling these pests. After the leaves have turned yellow, let the pot dry out completely to dry up the old roots and tubers otherwise they may turn into a soggy mouldy mess and rot may destroy the adjacent new tubers. REPOTTING: The plants are not repotted but left in the same pot year after year. SUMMER CARE: Keep the pots shaded and allow the pots to dry out between light waterings until mid-February when they should be set out in their growing positions and watered a little more often. The tubers of some species will rot if kept wet during the dormant period, others will produce plants prematurely which are then attacked by pests such as thrip and red spider and fungal diseases in the warm weather. A thin layer of new leaf litter is placed on top of the existing leaf litter each summer to feed the fungus. Chopped gum leaves or sheoak needles are suitable. We frequently receive entries from Western Australia but this month our entries were from both the west and the east. Allen Jennings entered a Calanthe triplicata (Christmas Orchid) from New South Wales. Pauline Meyer’s was from the west, (Western) Flying Duck Orchid, Paracaleana nigrita. 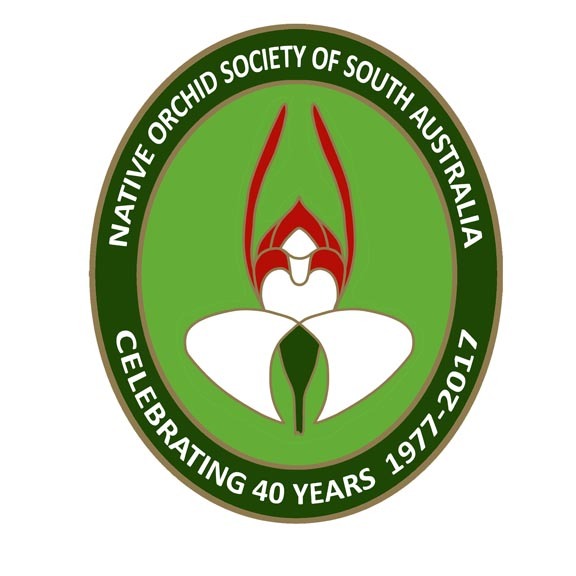 The other entries were South Australian, Jenny Pauley’s recently photographed Leporella fimbriata (Fringed Hare Orchid), Greg Sara’s Thelymitra rubra (Common Pink Sun Orchid) and Judy Sara’s Plumatochilos sp. (Bearded Orchid) and Arachnorchis sp. (Spider Orchid). The winning photograph was Judy’s Spider Orchid. Obviously it was one of the Green Comb Spider Orchids – A. dilatata complex. Of this group there are about a dozen possibilities. Knowing the location, Mt Boothby, helped to narrow the options with the most likely candidate being Arachnorchis stricta but it wasn’t convincing. It would appear that the tips of the sepals may have been chewed off when in bud. A distinguishing feature of this species is that there are no clubs or osmophores on the sepals. Other species of this complex have clubs. Another feature is that the dorsal sepal is bent over the column unlike many other green combs which have an erect dorsal sepal. The features that caused doubt were lateral sepals looking droopy instead of being characteristically stiffly held out but dry conditions could cause this. The other was that the labellum did not strictly fit the description of A. stricta but then again it is a variable species. The conclusion was a possible hybrid but there is no information on the likely parents or that is an atypical A. stricta that may have been damaged in bud. This is an example of the difficulties that can occur when attempting to identify a plant from one photograph.